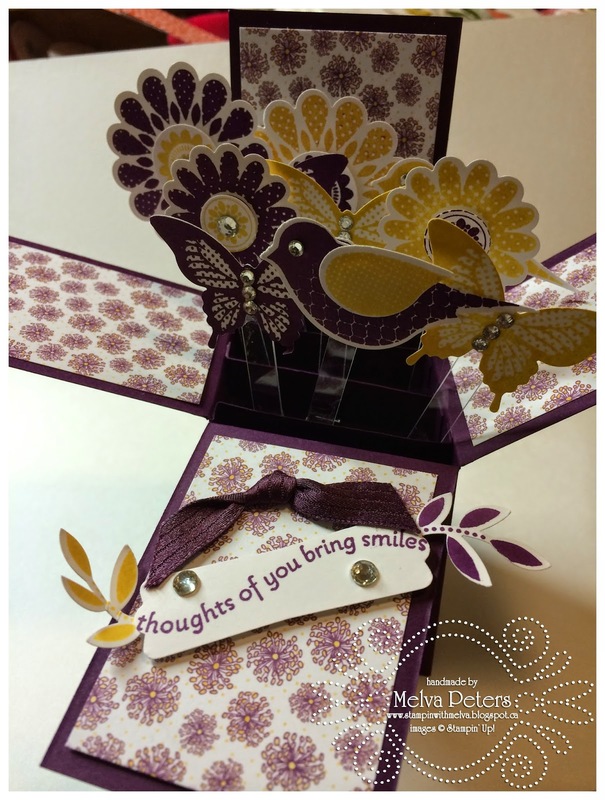 Stamp with Melva: Looking for a WOW card to send? Check out Card in a Box! Looking for a WOW card to send? Check out Card in a Box! 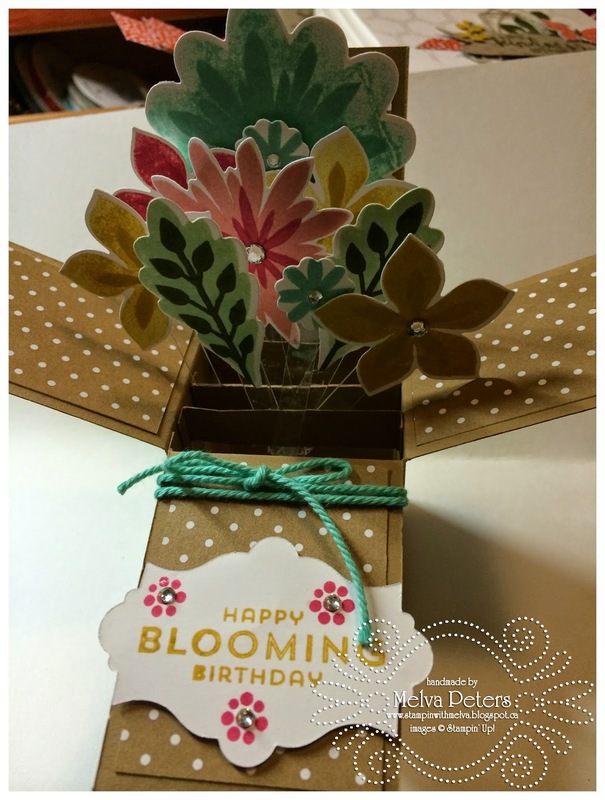 I love making a card in a box because I can just imagine the look on the recipient's face when it is open. These cards fold flat to mail and fit into a regular envelope but when they open they magically open into a 3-dimensional surprise. 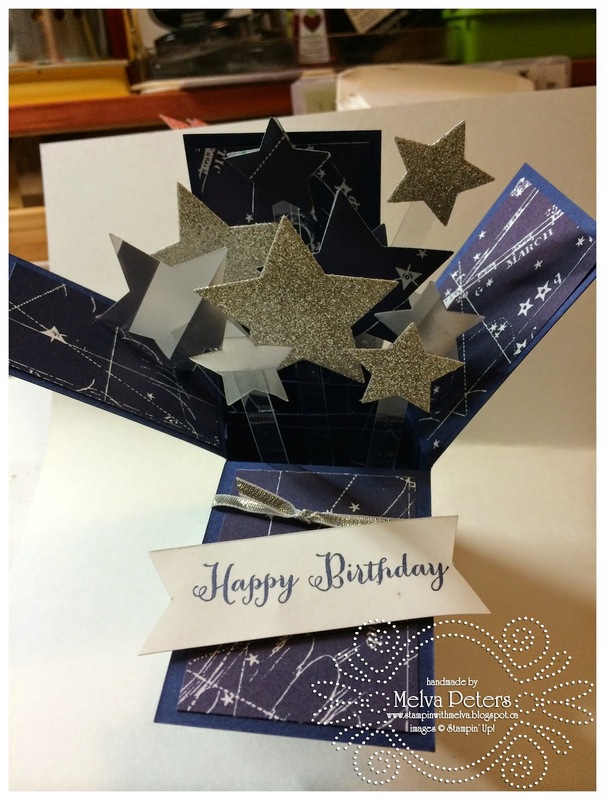 Check out the cards we will be making in my upcoming Card in a Box class on August 14th from 7-9pm. There's still room for you if you'd like to register. Email me or click here to register. Box: Card Stock cut to 8 ¾" x 5 ½" and scored at ¼", 2 ⅜", 4 ½" and 6 ⅝" on the long side then turn and score at 2 ¾" on the short side. Cut down to the centre score line on the 4 score lines from the top and cut out the small tab on the side (leaving the bottom tab). Fold your box along the score lines - I don't fold down one tab that will be the back. Inserts: Cut Card Stock 2 ⅝" x ½" scored at ¼" and 2 ⅜". Apply double sided tape to each side - I put the tape on the opposite side and fold one tab forward and one backward. DSP: Cut pieces 1 ⅞" by 2 ½" - I use different DSP around the bottom of the box and on the inside of the box, but this is your preference. You need 7 pieces in total. Back: Cut Whisper White or Very Vanilla Card Stock 5 ¼" by 1 ⅞". This becomes the back of the box and you can stamp a sentiment on this piece. Decorations: You can decorate as you wish. Stamp sets with coordinating punches like Polka-Dot Pieces (Item # 128708) or with coordinating framelits like Flower Patch (Item #134207) and Flower Fair (Item #133731) make it really easy. If you have questions with the instructions, leave a comment or email me. Come and join the fun at my class - Email me or click here to register. Have fun making these cards that are sure to surprise anyone who receives one!